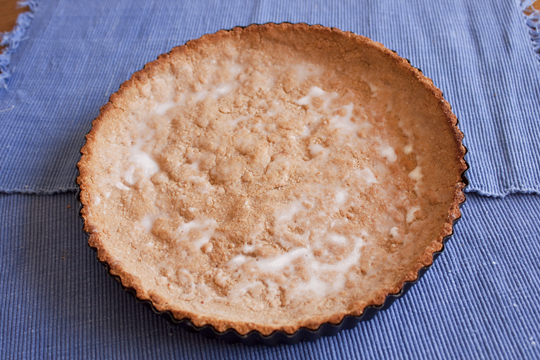 Above: Coconut and almond tart shell baked, chilled and brushed with coconut oil. Making this tart crust/shell is pretty easy: just mix the ingredients (as per instructions below), grease the tray, press ingredients in tin and then bake! 1.5 C. almond flour (i.e. ground almond meal) (Nb: you can use all coconut flour instead of the 1.5 C almond flour, if you like- I personally prefer this tart shell with the almond in it (taste wise)). Preah-heat the oven to 160 degrees C (~320 degrees F). Nb: I used a fan-forced oven. In a large bowl sift the flours, cinnamon, salt and bicarbonate of soda together. Melt the coconut oil and honey together (i.e. in a small saucepan on a stove top) and then pour into the flour mixture. Use a wooden spoon to disperse the coconut oil evenly into the flour mixture. Leave this mixture to cool to room temperature. Beat the eggs and then in 3 batches, mix the beaten eggs into the tart shell mixture. Mix until you have a mixture that resembles a crumbly dough. 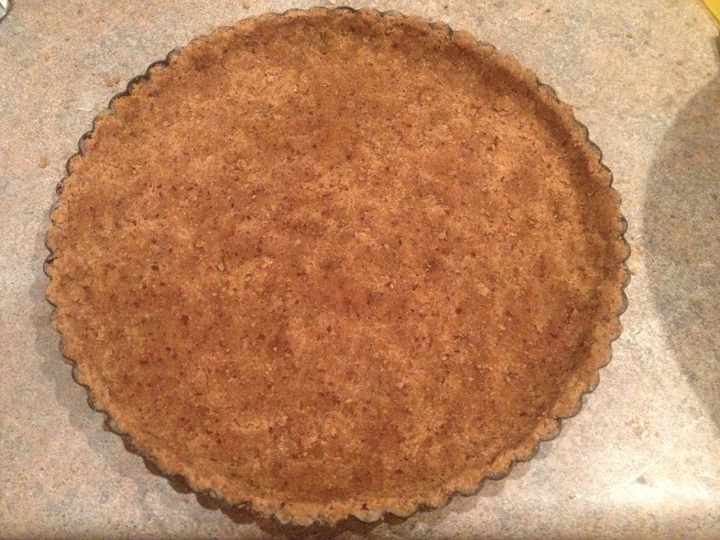 Grease the tart shell you are planning to use with coconut oil. 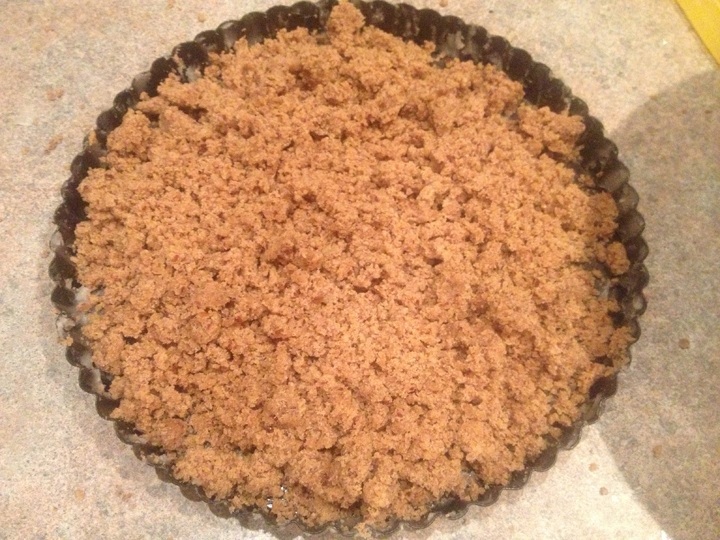 Then press the mixture evenly onto the bottom and sides of the tart shell. Make sure to firmly press the tart shell – this will help keep it together and prevent it from breaking. Place a piece of greaseproof paper over the tart shell and then place some baking beads on top to hold down the tart shell when it bakes. Bake the tart shell for about 11 minutes at 160 degrees C (~320 degrees F) or until lightly browned. When it is cool, remove the greaseproof paper and baking beads. 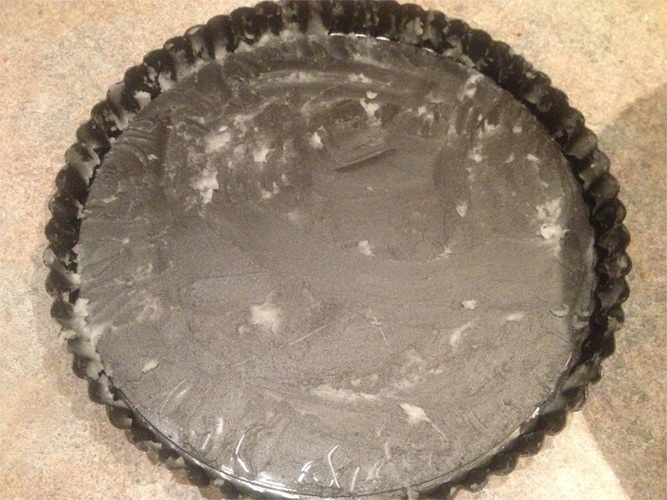 Brush the baked tart shell with coconut oil. Fill with your favourite tart filling!